GWP Architecture have been recognised for their work on the Bombay Sapphire Distillery and Visitor Centre, Laverstoke at the Annual Civic Trust Awards. The scheme won this year’s Special Award For Sustainability at the ceremony held at the Guildhall, Winchester on Friday 10th March. 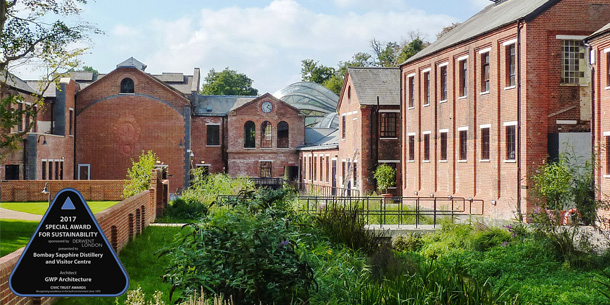 The winning scheme created new premises, within an existing Victorian mill complex in rural Hampshire; for the production, storage and distribution of the globally established Bombay Sapphire Gin. The complex site itself is a Conservation Area, includes three Grade II listed buildings and the SSSI protected River Test that runs directly through the centre of the site. The development sought to become a leading example of sustainable design and retrofit. It secured a BREEAM ‘Outstanding’ rating of 86.81% – the first industrial or refurbishment scheme of any type to achieve such a high standard, incorporating renewable energy systems which reduce CO2 emissions by 60% including biomass, photovoltaics and hydropower. The distillation process was seen as an opportunity to drive sustainability by including a number of inventive ways to minimise energy loss; heat generated by the stills is recovered and re-used to preheat supply air to the tropical climate glasshouses and warm water gathered from the condensation process after infusion is used to pre-warm the pure alcohol added at the start of the process. Botanicals for flavouring are not wasted once used, they provide a fuel source for the biomass boiler, providing free heat across the visitors centre. The circular economy continues as the potash by-product of the biomass boiler is then exported locally for use by organic farmers. National Panel member and sponsor John Davies from Derwent London said the scheme was “An exemplar in quality, innovation and tradition. It integrates the ethos of the company within the existing community and provides a focal point for the area”. GWP Architecture worked with GWP Project Services alongside Bacardi Ltd and Bombay Sapphire to deliver this project as executive Architects and BREEAM Assessors respectively.